No bars? There are a number of hacks to boost your cellular signal that don’t require you to change providers or even get on the phone with your phone company. For starters, get near a window. Walls are known for blocking cell signals and by standing near a window, you’ll position yourself in a clearer path towards your nearest cell tower. If a window isn’t an option, try going upstairs or increasing your elevation in some way. This too will help you get in closer contact with a cell tower. Not sure where your closest cell tower is? Try checking with an app such as OpenSignal. While there are things you can do physically, there are also things you can do technologically, such as charging your device and closing any unused apps, which will give your phone more power to devote to finding cell signal. Still no luck? Another option is turning your phone on airplane mode and then switching it back after five seconds, which will reboot the signal. 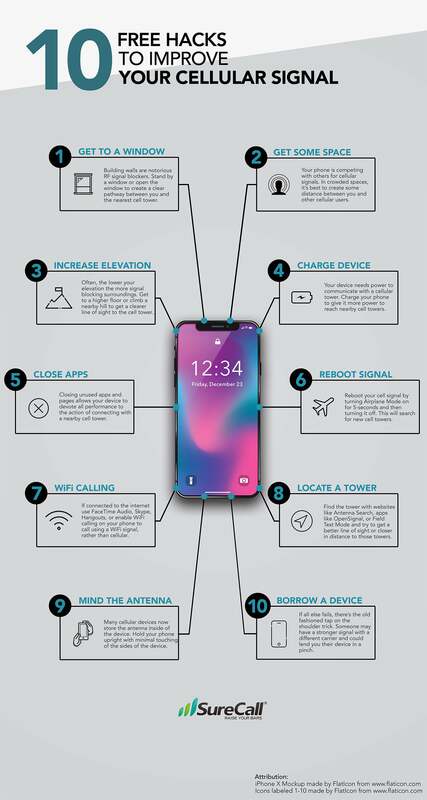 To learn more, here are 10 free hacks to improve your cellular signal.